Affiliation : * The Shree Somnath Sanskrit University, Veraval (Graduation – Shastri, Post Graduation – Acharya, and Master of Philosophy – Tattvacharya). * GSEB (Gujarat Secondary Education Board) – Grades 6th to 12th. 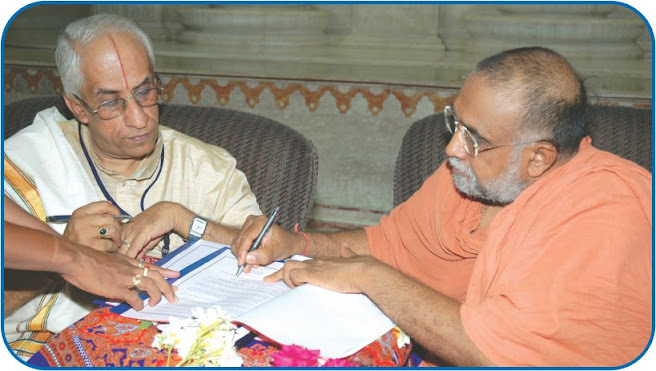 MOU : * DSS has entered into an MOU (Memorandum of Understanding) with a nationally reputed ASR (Academy of Sanskrit Research – Melkote) which supports and recognizes research work carried out by the students and staff of DSS, under the department of Shrut Raksha Nagam in association with Vimukti Vishwa Vidyalaya, Ahmedabad. * DSS is also associated with the Lakulish Yoga University, Ahmedabad for providing Yoga Training to students through MOU.